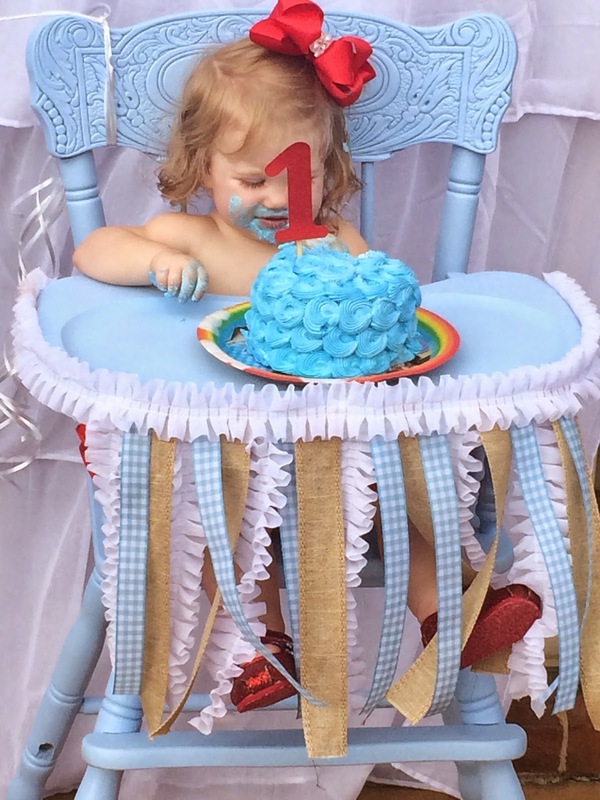 As most of you know I spent months and months meticulously planning my little munchkin’s first birthday party. I had a notebook full of list after list of decoration ideas, projects, food, etc. There were multiple days when I had to ask my mom or my sister to come over just to watch Raley so I could actually get some of my projects done. Every off day I had for the 2 months leading up to this party I was planning, shopping, or working on some sort of project in preparation. Well, it all payed off because it turned out perfect! It took a while to get everything together in blog form but here it is! 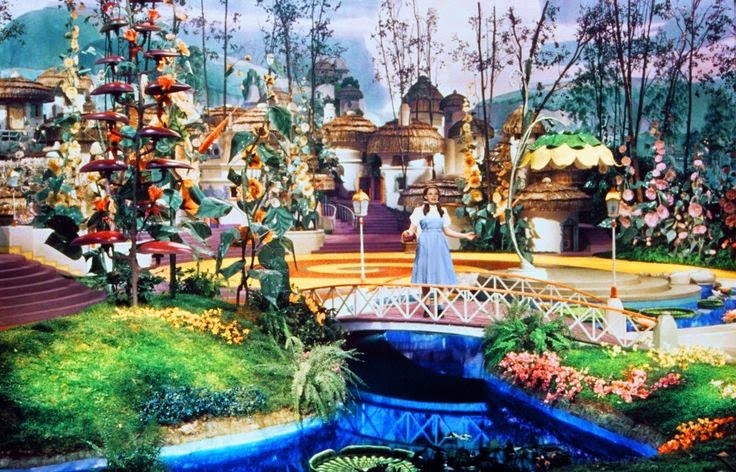 We’ll start where all the guests started – The yellow brick road! Leading from the end of the driveway to the front door I made a yellow brick road out of bulletin board paper. It took a full 50 ft roll of paper and took MUCH longer to make than I thought it would. I would try and squeeze it in between other projects and work on it during nap time and it probably took a good 4 or 5 days to get it done. Luckily I have a sweet hubby who saw that it was getting down to crunch time and I still had alot left to go and was stressing about it so he helped me draw the bricks. It went much more quickly that way! 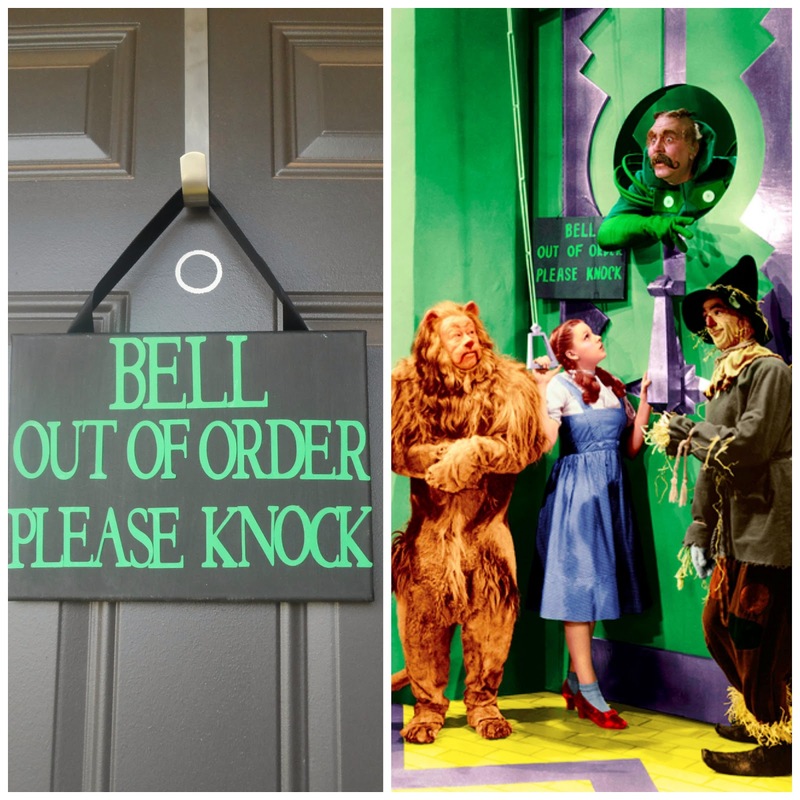 I also made a sign encouraging guests to “Follow the Yellow Brick Road.” I just used a campaign sign, covered it with some of the scrap bulletin board paper, and cut the letters out on my cricut. Easy peasy. I made the witch legs out of straw. I got some kids sized striped leggings and stuffed them with straw. I got some cheap shoes from the thrift store and made the ruby slippers. I made a pair of slippers for the witch legs and I made a pair to go on the Dorothy table. It was super easy. I used Martha Stewart glitter glue and extra fine red glitter. I got a large container of glitter but it didn’t take much at all! And they turned out looking so cute! 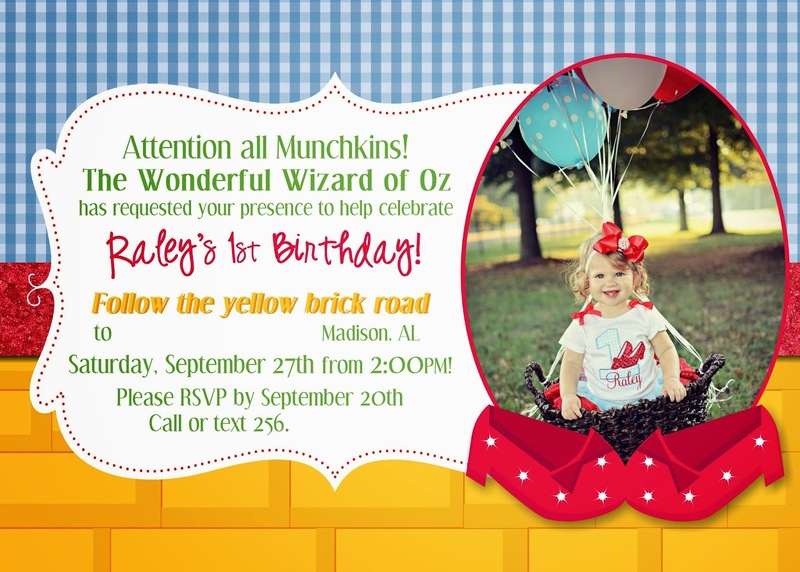 Even her invitations encouraged guests to follow the yellow brick road! Dorothy and the Scarecrow come across in the movie. On the table I had a pop-up book, one of Raley’s 12 month pictures on top of my Wizard of Oz box set, and a vase for notes for Raley. To the right of the table were the favors. I found Wizard of Oz sticker books at Michaels and added some bubbles. All of her guests were 2 or under so it was hard to decide on what kind of favors to get. The pages in my planning notebook have ruby slippers in the bottom right corner so I cut out some pages into the size of note cards. I made a sign that said “Leave a note or a wish for Raley on her first birthday” and had everyone put their notes in the vase. I just wrapped burlap ribbon around a vase that I had used at my wedding and stuffed it with shredded paper gift stuffing (I don’t remember what this stuff is called). After the party I put all the note cards in a photo album and am planning on filling it with photos from the party for her to look at for years to come! Above the entry table was this sign. My best friend Kristen does graphic design and she designed it for me! Then I just had it printed at Staples (only $15) and glued it to a foam board. It turned out EXACTLY how I wanted! *Just a side note…Staples was MUCH faster and MUCH more friendly than Office Depot. When I went to get her invitations printed I first went to Office Depot because I was on that side of town. I figured I would run in real quick, order them, and then come back to pick them up. I stood there for about 10 minutes and no one even asked if I needed help. And there were plenty of employees around. Just a “we will be with you in a moment” would have made me happy. So I left and went to staples. They were quick and nice and had my order done in minutes. So when it was time to get her poster printed I went back to them. And I plan to go to them for all my printing needs from now on….Rant over. So for the entertainment center I used some accent pieces that I already had. When I was about 12 until I was like 16 my room was decorated in Wizard of Oz (told you it was my favorite movie). I had the whole plate collections, dolls, lots of other little accents. I also framed some of her 12 month pictures to go on the shelves. I also had these little Madame Alexander dolls from when McDonalds had them in their Happy Meals years ago. They are adorable! Of course I had Wizard of Oz playing on the TV! In the kitchen I hung ribbon and hung each of her month pictures on them. I cut out numbers on my cricut using more “girly” rainbow colors and pasted them on paper doilies that I got at Hobby Lobby. I hung the pictures with clothes pins. I had to tape the doilies because they were too light and caused the ribbon to flip over. I think this and the entertainment center were my favorites! I called this area “Munchkinland” See more food detail here. In the top left corner of the room I hung a bouncy ball that I painted with pearl pink paint to look like Glinda’s bubble. On the right side of the table I hung a “hot air balloon” from the ceiling. I blew up a white balloon, covered in with “creepy cloth” (that you find in stores around Halloween) and tied it to a small wicker basket. I used one of Raley’s white ruffly curtains from her bedroom in the middle and used my old gingham curtains from my Wizard of Oz room. I tied the gingham curtains back with burlap ribbon. One of the things I was most proud of that I made was the table cloth. I made it out of my old bed skirt, some burlap, and a gingham window valance. I am NOT a sewer so I used the no sew hem glue to stick the valance and the burlap to the bed skirt. I love how it turned out! I used my cricut to make this Happy Birthday Sign. I looked and looked for gingham print scrapbook paperto make this with but couldn’t find it anywhere. So I just used plain blue paper as the bottom layer. 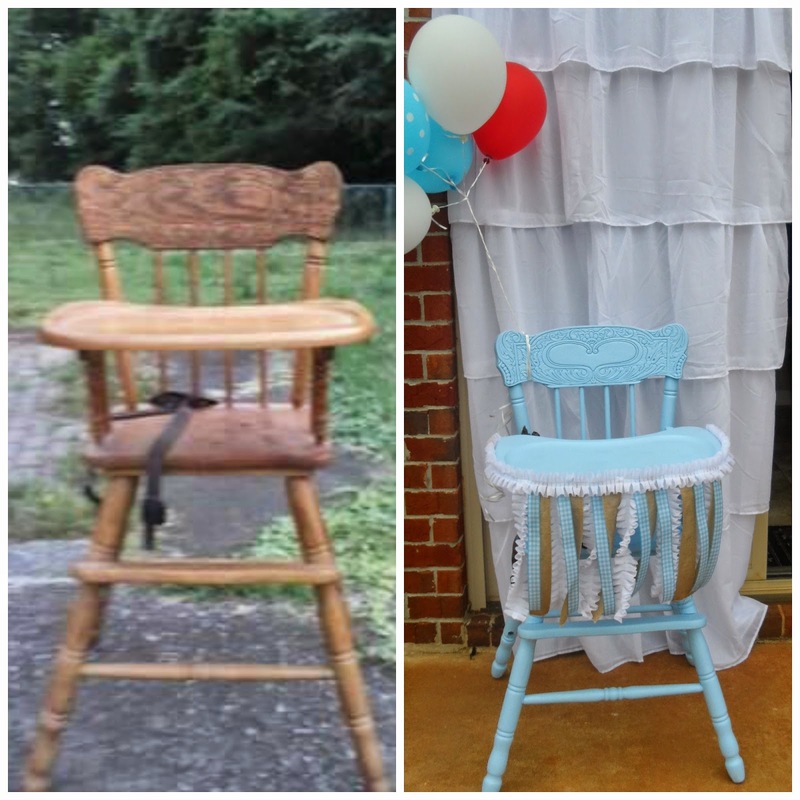 I glued it to white lacy ribbon and pinned the ribbon to the curtains. 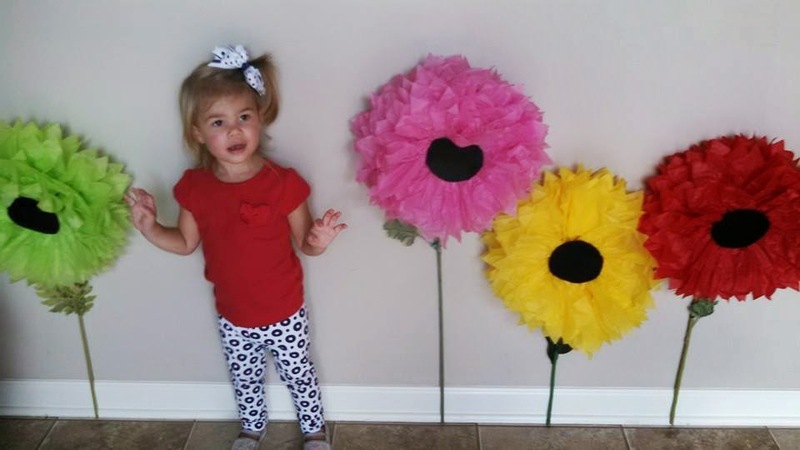 Munchkinland inspired flowers! Colorful and fluffy! We made these out of those big party puffs. Flattened one side, glued a black circle (made of felt) to the center. Then I used the stems from the flowers used for the outside tables and hot glued them to the back. In the kitchen, where I had the punch set up, was inspired by the Emerald Green colors of the Land of Oz and the Wicked Witch. I started with “Melted Witch” punch and went from there. I wrote out the Certificate of Death with a paint pen (the Coroner of Munchkinland’s proclamation of the witch’s death). Behind the punch I filled some vases with water and colored it green with food coloring. I also added some green and clear stones to the vases. I got vases of varying heights to represent the Emerald City. I got some more of those foam letters, first painted them green, then glittered them. I got a small container of fine green glitter and used the Martha Stewart glitter glue. For drinking cups I glued ribbon inspired by colors from the movie around mason jars. Red glitter ribbon for ruby slippers. Blue gingham ribbon for Dorothy’s dress. Green glitter ribbon for the Emerald City. Made this sign with my cricut to go above the door leading outside. All day it had been really cloudy but it wasn’t supposed to rain so we went ahead and set up outside. The temperature felt perfect. When we set up the wind picked up and was blowing the table cloths and the props everywhere. But by party time the wind had died down and the sun came out! The tables in the backyard were set up to represent each character. For the Cowardly Lion’s table I used a tan tablecloth. I found some flowers that reminded me of the Lion’s mane. I ordered the badge of courage from the same place I got the tinman props. I made the green crown like the one the Lion wears while singing “If I were king of the forest.” I took a piece of scrapbook paper and taped green duct tape all the way around it. Then I cut it out with a jagged top like the one in the movie.